This morning, the California Public Utilities Commission approved the transfer of the Bright Fiber Network Project (which had received a $16.2M California Advanced Services Fund grant in December 2015) from Spiral Internet to Race Telecommunications. This is exciting news for Nevada County. The gigabit fiber optic internet project will now start being constructed. Race has the team, experience, and matching funds. They, like Spiral, began as a small business; growing as ten similar projects were funded and brought online across California. They are good ethical business people. It’s why I asked them to come on board in late 2017. For me, this is a transition forward after a long — sometimes tumultuous — journey. 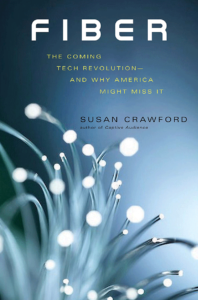 One that Susan Crawford summarizes quite well in her recently published book “Fiber: The Coming Tech Revolution — And Why America Might Miss It“. Check out Chapter 6 following the Chattanooga story (then read it all). You will find her book both engaging and outraging. I had the pleasure of sitting down and talking with Susan, who is a Telecommunications Law professor at Harvard, a number of times over the past few years. She’s one of my heroes, as she routinely dukes it out with the large cable and telco companies. The chapter also includes interviews with Stephanie Ortiz and Rorie Gotham, two of my favorite community leaders. The fulfillment of the Bright Fiber Network Project is why Nevada County won’t miss out. When Chip Carman and I embarked on our goal in 2008 to bring a 21st century internet network here, I had no idea it would take over ten years to get to this point. I also didn’t know that he wouldn’t be with us. I am relieved and excited that 2019 will be the year of gigabit fiber optic internet speeds here. As I’ve said before, our future is bright. Thanks for your patience and willingness to believe. It truly kept me going all along. … You want to read more on Race’s blog. Eight years ago today, we hosted the 95959google Rally March Party in Nevada City. We did want to get Google’s attention, but really we wanted to see if our community might get excited about having a gigabit 100% fiber optic internet connection brought to homes and businesses. It’s been a long journey to get to now. Google chose Kansas City, then a few more cities, then decided that building gigabit fiber optic networks was hard work. So it retreated. Spiral, however, hasn’t. I promised more frequent updates. And this one is short. We’re weeks away from announcing how the project moves forward, and when we put some shovels into the ground. Stay tuned. Good progress is being made. I know that we’ve been a bit quiet here at Spiral, as we complete the steps to begin construction of our gigabit fiber optic internet project. Even though there is little to report, I wanted to share with you what’s been happening. The process over the past five years involved attorneys, investors, banks, challengers, regulatory agencies … all entities that move at their own pace with their own agendas. What should take weeks often takes months, and sometimes years to complete. If I have erred in any way in communicating to our community, it has been due to my inherent positivity. Announced dates and benchmarks have passed unfulfilled. In that, I apologize. Yeah, crappy outdated internet access makes us all angry. I get it, as I have DSL at home. And I’m lucky, as I know many households have nothing. Especially in the outlying areas covered by our first phase. In February 2013, when we submitted our grant application, we expected it to be approved within 9 months. That didn’t happen because SmarterBroadband, a local fixed wireless provider, incorrectly claimed 100% coverage throughout western Nevada County with a federally funded project that had yet to be built at that time. So, our grant application — although essentially approved — was put on hold by the CPUC for two more years. It was finally approved for funding in December 2015 after the CPUC determined that, at best, SmarterBroadband had 20% coverage in our phase one project area. Once the grant was approved, our environmental report took another year and a half to compile, submit, and then be voted on by the CPUC. During that period investors and banks signed on and left, frustrated by the timeline. We are currently reviewing multiple investment offers for the private matching funds. The $16.7M CASF funding remains ready for our use. Also numerous people have come and gone at Spiral. None of this is news. It is just what happens in business. Building a brand new underground network is an amazingly complex enterprise. If I had known at the start how long it was going to take and how much it would cost because of the delays, I actually might not have taken it on. But both I and Spiral are staying the course. Nine years of my life so far have been dedicated to its completion. I am personally committed to getting it built and operating. We are actually getting close to the place where we can break ground. How close you ask? When will I have service? I truly don’t know an exact date, but we do plan to break ground this year and have the first phase completed within two years. That I can promise. And you will be the first to know just before the shovels hit the ground. Thanks for your support and patience over the years.